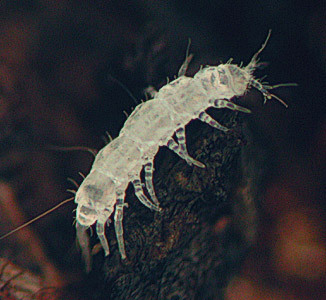 Pauropods are small (less than 5 mm), pale, terrestrial arthropods that are rarely encountered by the casual observer. Superficially they may resemble insects such as collembolans or psocopterans, but adult pauropods have 11 (or sometimes 12) body segments and 9 (or sometimes 10 or 11) pairs of legs. They also possess unique forked antennae (see figure below) and a distinctive locomotory pattern characterized by rapid burst of movement and frequent abrupt changes in direction. Most pauropods lack eyes and a tracheal system. Habitus of a typical pauropod, Pauropus huxleyi. Note the unique forked antennae. There are eleven body segments, and nine of the segments feature a single pairs of legs. From above the apparent number of segments is smaller since a few of the segments are partially fused along the back. Drawing after Lubbock. Pauropods can be found in soil, decaying wood, leaf litter, and other moist places, where they feed on fungi and decaying organic matter. Over 500 species of pauropods have been described so far. Adis, J., U. Scheller, J. W. de Morais, and J. M. G. Rodrigues. 1999. Abundance, species composition and phenology of Pauropoda (Myriapoda) from a secondary upland forest in Central Amazonia. Revue Suisse de Zoologie 106:555-570. Hagvar, S. and U. Scheller. 1998. Species composition, developmental stages and abundance of Pauropoda in coniferous forest soils of southeast Norway. Pedobiologia 42:278-282. Scheller, U. 1970. The Pauropoda of Ceylon. Entomologica Scandinavica Suppl. 1:5-97. Scheller, U. 1976. The Pauropoda and Symphyla of the Geneva Museum II. A review of the Swiss Pauropoda (Myriapoda). Revue Suisse de Zoologie 83: 3-37. Scheller, U. 1982. Pauropoda (Myriapoda) from the Seychelles. Entomologica Scandinavica 13:245-265 . Scheller, U. 1984. Pauropoda (Myriapoda) from Canada. Canadian Journal of Zoology 62:2074-2091. Scheller, U. 1986. Beringian Pauropoda (Myriapoda). Entomologica Scandinavica 17:363-391. Scheller U. 1990. Pauropoda. Pages 861-890 in: Soil Biology Guide. D. L. Dindal, ed. New York. Scheller U. 1990. A list of the British Pauropoda with description of a new species of Eurypauropodidae (Myriapoda). Journal of Natural History 24:1179-1195. Scheller, U. 1995. First record of Pauropoda (Myriapoda) from Sierra-Leone. Entomologica Scandinavica Supplement:3-53. Scheller, U. 1999. The taxonomic composition and affinities of the Brazilian Pauropoda with descriptions of three new species from Central Amazonia (Myriapoda, Pauropoda: Pauropodidae). Amazoniana-Limnologia et Oecologia Regionalis Systemae Fluminis Amazonas 15:169-182. Scheller, U. 2001. Pauropoda and Symphyla of the Geneva Museum 11. Pauropoda (Myriapoda) from Sabah (East Malaysia). Revue Suisse de Zoologie 108:949-986. Scheller, U. 2002. 5.3 Pauropoda. Pages 535-545 in Amazonian Arachnida and Myriapoda. J. Adis, ed. Sofia, Moscow. Page: Tree of Life Pauropoda. pauropods. The TEXT of this page is licensed under the Creative Commons Attribution-NonCommercial License - Version 3.0. Note that images and other media featured on this page are each governed by their own license, and they may or may not be available for reuse. Click on an image or a media link to access the media data window, which provides the relevant licensing information. For the general terms and conditions of ToL material reuse and redistribution, please see the Tree of Life Copyright Policies.